Contact details for all testimonials available on request. I went to Sophie for help when I was really very ill. I had flu one month then pneumonia which wiped me out. My immune system was shot and I was exhausted. I have followed Sophie’s nutrition advice and coaching. One year on I am so well I haven’t had a cold for a year! I feel great and I look great. One side effect of the healthy eating is the weight loss. I have dropped 2 dress sizes and now enjoy exercising without breathing difficulties. Thank you for helping me turn my life around Sophie! I’ve been seeing Sophie since June this year and I am so pleased with how it’s going. I’ve had a wardrobe clear out today and will be sending lots of things to the charity shop as they are now way too big!! 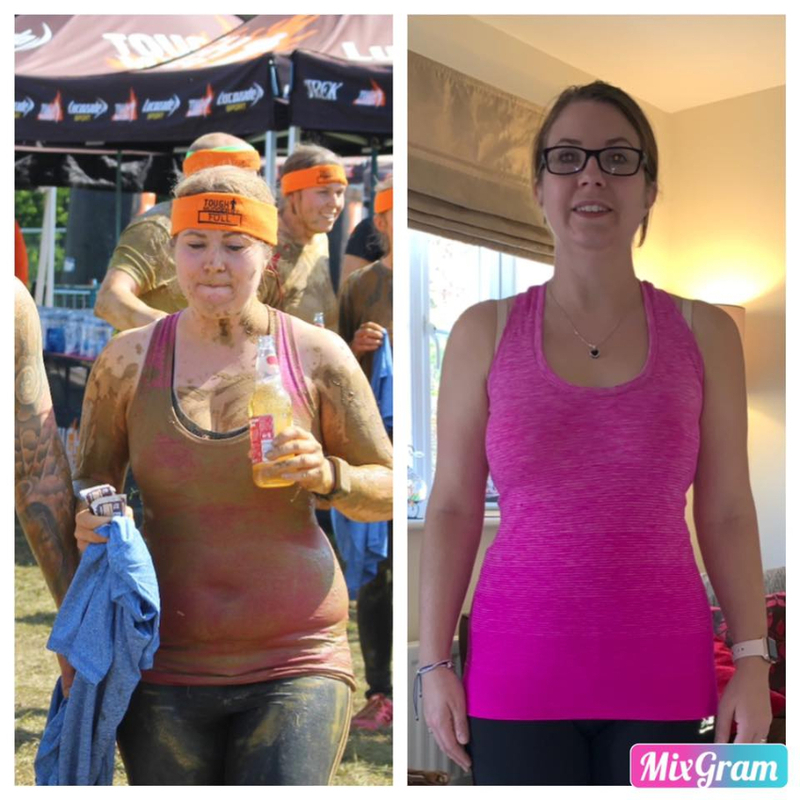 So far I’ve lost 18lbs and wanted to share this before/after shot with you (the before is me having just finished a Tough Mudder in May, the after is today). Until you do this it’s sometimes hard to remember how far you have come. I still have a way to go to my target weight but I feel so much healthier and happier in my own skin 😊💕Thanks Sophie!! Hi Sophie, Your nutritional advice has paid off, my appetite is much improved as are my energy levels and I've regained half of the weight I lost. It's a slow job but you said it would be. All the hospital tests/procedures returned negative results which was good though a sputum sample requested by a respiratory doc grew a bacteria haemophilus influenza! I've since had 2 courses of antibiotics which have hit it on the head and I'm now taking your recommended probiotic capsules. I'm so relieved I'm feeling so much better. Thank you for your help & advice it was a good support. I want to thank you for helping me to finally feel alive! Since my first visit to see you I have achieved so much. When we first met I had been suffering from stress and was exhausted, both physically and mentally. As you know I was a serial dieter and was constantly battling with my weight. With your advice and support I have learned to enjoy 'real' foods and still lose weight; but more importantly I have learnt how to nourish my body and feel amazing. I just cannot believe how much energy I have now. My only regret is not coming to see you sooner. Thank you Sophie. I began suffering with IBS symptoms 2 years ago shortly followed by acid reflux. Advice from my doctor was to cut out certain foods but with this limited information it was very much trial and error. When I tried excluding things it didn't seem to make any difference and I was getting more and more confused about what I could eat - and I began putting on weight as well. Seeing Sophie was the best decision I ever made. She clearly explained the background to both conditions and helped me understand why the foods that irritated me seemed to keep changing and how my emotions contributed to my symptoms. I went away with knowledge of not only what to cut out from my diet but more importantly what to add to it. Within a few weeks my symptoms had almost entirely gone, I no longer had the constant background headache that I hadn't even realised was linked to my diet, and I had lost 11lbs. I can't thank Sophie enough and I recommend her to everyone I talk to. I've also appreciated the support I've had from you in previous sessions for the same reasons. I'm sure you already know this by now, but you're very good at what you do - thank you! I thought you may like to know how I have been getting on since I last saw you in November. You will be pleased to know that I have not had constipation for about 3 - 4 months and am not taking any laxatives. My diet is going really well, I have been experimenting with foods as you suggested. Thanks to your advice, I feel that my prolapse problems are going to be easier to deal with as I am in control of any constipation. I am pleased to report that my fibro pain has not been as bad this winter as usual. As the weather recently has been very cold and damp I would normally have had at least one or two flare ups, especially as we traveled up to Scotland for New Year. I have not had a significant flare up at all this winter, which is brilliant. So I would like to say a very big thank you for all of your help and support, I will certainly recommend you to anyone else who may need help in the future. Such a huge thank you to Sophie for helping me along this journey. I've never looked or felt better than I do right now. After a years worth of hard work I've kicked my unhealthy size 4 self to the kerb and I'm enjoying life as a healthy size 8/10. Still more goals to hit but for now I'm pleased as punch - go me!! I have just had the most incredible results in six weeks after struggling for 3 years. Sophie is very thorough and her knowledge of nutrition holds no boundaries. I have fructose intolerance and after seeing Sophie I realise there are other issues with food for me as well. After two consultations I was given the most life changing information and am now on the right path to leading a healthy and more fulfilling life with my family. I even enjoy food and cooking again. Why did I struggle for 3 years! Thank you Sophie for all you have done. I would recommend everyone comes to you for advice on all aspects of food and how our digestive system works. Thank you once again Jamie. We can't thank you enough for the advice you have given us. Jamie is like a different person - he's always in the kitchen cooking and trying new foods off his list, and his energy for life is back. He eats lots of fresh fish which he is loving and always has his head in the new bible in our house (the cookbook you recommended). He takes his vitamins and good bacteria and has noticed a massive difference with his gums, hair and skin and even the whites of his eyes are white! Everyone who we see can't believe the difference and he has even had family start crying with relief because he looks so much better. Once again Sophie thank you so much it has really transformed Jamie's life and put a positive mood on our family life so that we can move forward. So this last year has seen me on a bit of a journey for myself. I took the time out to look after myself and more importantly love myself. I made the change to go see a nutritionist to help with my weight and mental health. I'm proud to say I've now lost around 5 stone and made some positive changes in my life. I feel so much better in myself, I've much more energy and even go to the gym now! (eek!!) Bagging up all my old clothes that no longer fit and getting rid of them feels amazing. Being able to walk into a clothes shop and not worry about if they will have anything to fit me is such a wonderful feeling. Its given me so much more confidence, even in the little things in life. I love food. I am overweight and have struggled all my life (even as a child) to manage my weight. Then I found Sophie at The Beauty Clinic. She is not an overnight wonder solution. She is the support you need to make the changes that will help you towards a healthy relationship with food for the rest of your life. Not only is everything is tailored to you, Sophie is real about the challenges you face and how to overcome them. Having lost over 1 stone I still have work to do but I now understand more about my food habits, what I need to change and can see the results of the changes I have already made. I have had support to use the right supplements to support my health and now have more energy and feel healthier than I have in years. If you need help with food or nutrition issues, I would recommend you speak to Sophie. I just wanted to say a huge thank you. As of today I have lost 7lbs and have never found sticking to something so easy. No messing about working out points or weighing things ... and I find that I don't actually want sweet things. Also using loads of new recipes and trying to mix things up. I don't even stop at the dessert fridges now when I go shopping, or want chocolate. Can't believe the difference. Sophie was highly recommended by a friend. I am so glad I went to see her. Having followed Sophie's advice , I can absolutely describe it in those over-used but necessary words, LIFE CHANGING. My doctor said she had never seen someone's health respond so positively to a change in diet and A YEAR ON, I am still reaping the same benefits. I had had two tragic bereavements and my own high pressure business in a busy media environment. Truly, when I took on board the advice she offers on specific foods to add and delete from your diet, supplements to use and avoid, work- lifestyle issues and generally being what women are rubbish at- 'putting our own gas masks on first'- I turned my physical and emotional health around completely. Almost no cravings, hormones much more in control, everything more in control actually! I now recommend a nutritional consultation to many people I meet I see struggling when there is no need. Even my son going off to university... Sophie did an awesome job influencing him! My friends juggling far too much in their 40s and 50s, over-eaters, under-eaters... stop trying to guess what to do and just ask for expert help from someone who has spent years researching the best solutions. You can't put a price on your health- Sophie can help give it back to you in a no-fuss, simple and practical way. Act NOW and start reaping the benefits...honestly. It's a real no-brainer. I have one of those jobs that is very stressful and my eating habits that I thought were helping me were in fact not helping me cope with the pressures of the job. I was looking for help and advice on how to cope better as I love my job, but I was clearly not coping. Throughout my contact with Sophie, she was very supportive, is very knowledgeable about the food we intake and its impact on the body (good & not so good). At my initial consultation Sophie listened to me and fully understood what I was going through and offered up practical and easy to understand advice that made sense to me. I feel as a result from my visit to Sophie, that there is light at the end of the tunnel for me and I have a robust plan to keep myself on a better track of healthier eating. Thank you so much for showing me this way of eating - I love it and will eat like this forever now; I have been able to lose weight and keep it off for the first time. The food is delicious - I certainly don't feel like I am on a 'diet' - and I am delighted with the results. I started working with Sophie in February this year. Having been on every diet over the last 15 years I was looking for some way to permanently change the way I eat to be able to maintain my size and weight rather than continued yo-yoing. Sophie's approach is very practical, simple and realistic which meant all her advice was easy to follow. She also takes time to explain the rationale behind her suggestions which meant I understood why certain foods were having a good or bad affect on me. I am now aware of how different foods make me feel, I now love vegetables and am rarely hungry apart from when it's actually time to eat. I feel I can make much better food choices whether I'm at home, away or on the move. I'm much more aware of nutritional values in foods but I don't have to calorie count, eat fat free or cut out carbs, and it's lovely to have real treats without feeling guilty. For over 20 years I suffered from fatigue and irritable bowel syndrome. In the last 4 years my symptoms had become crippling to the point where I could no longer work or exercise. I suffered neuro-muscular symptoms and was diagnosed with chronic fatigue syndrome. My life revolved around my illness. Having visited numerous professionals on many occasions I went to see Sophie with realistic expectations. Although I already ate fairly healthily, I thought perhaps that a better diet could give me 5% more energy. I would have been happy with that. Sophie gave me an eating plan initially which was a bit daunting, but I was determined to give it a proper try. Within a week all of my symptoms, irritable bowel, fatigue, muscle twitching/cramping had disappeared. I’ve been able to reintroduce lots of foods now although my diet has changed for life. It hasn’t even been hard thanks to Sophie’s common sense approach. Because of Sophie I have my life back. I’m working, exercising, and planning a biking holiday with my kids. Nothing I could say could explain how grateful I am to her for her knowledge and wisdom. And most importantly it was wonderful to have someone take the time to listen and really understand my life and my health. I really think anyone could benefit, even if you don’t have a ‘problem’. I’m planning to drag my whole family along for a consultation soon! When I came to Sophie I felt so ill. I was suffering from all kinds of scary symptoms like hypoglycemia, insomnia, anxiety, low blood pressure, incredible fatigue, IBS, constipation and permanent back pain. My doctor had diagnosed me as having anxiety disorder, and I had tried (and failed) to find answers myself. I'd got desperate . I didn't know where else to turn. Sophie was like a breath of fresh air with her calm and kind approach. She talked to me about a test I could request. I had never heard of this but I worked with my new GP and it turned out that - yes I had an auto-immune condition and that was what was causing my symptoms. It explained years of hormone, digestion and blood sugar balance issues and the relief of this validation was immense. The combination of medication and following Sophie's sensible and realistic guidelines has resulted in a massive turn around in my health. My blood sugar no longer crashes if I don't eat every 2 hours and I have more energy than I have ever had in my life! Sophie has changed my life! She also helped me to calm down in my approach to my health. I know that it will take time to fully re-balance my body but this is exciting rather than frustrating because I am enjoying massive benefits already. Sophie also gave me hope for the future - after a lifetime of feeling lethargic and run down I now have the energy to enjoy my life! Just had a great catch up with Sophie Leicester. If anyone wants some help to sort out their diet/eating habits I'd definitely recommend you try to book an appointment with her. Loving my new approach to food thanks Sophie! Sophie has helped us both lose lots of weight. I now have some lovely clothes in a size 12 which I never thought I would be able to wear! I feel very healthy and have enjoyed the different foods. We have completely changed the way we eat - we used to have lots of cheese, biscuits and cakes - now we have loads of vegetables, fish and lean meats. Thank you Sophie! Gary (Head Chef), June 2013 NB: Work with Gary was part of a corporate package. I wanted to lose weight and I knew my eating patterns were all over the place. ...The food diary was a great way for me to see what and when I was eating, ... and it helped me identify several issues that I could easily address. This is where help from Sophie came in and (as a result of Sophie's advice) I was able to lose 2 stone in about 8 weeks without strenuous exercise or dietary supplements. Healthy eating sounds boring and a lot of hassle to most, but it opens up a fantastic world of food creations and combinations. ... I have tried to pass my knowledge onto others through different projects at work such as 'Try me Tuesday' where we adapt simple meals to make them more healthy. Thank you Sophie! My name is Anthony and I have suffered from IBS for over twenty years and it had got to the stage where it had ruled my life. Every time I had a meal, or if I left it too long to eat, I would feel terrible. I have always loved spicy, tangy food and it had got to the point where I no longer had any interest in cooking because my meals were so bland, and meal times were met with a sense of dread, instead of enjoyment. I went to several different GPs over the years, and even tried hypnotherapy, none of which worked. I was introduced to Sophie through my wife who is also receiving advice and help from her and from the very first session we had, I felt positive because I knew straight away I was talking to someone who was interested, understood the problem and knew how to help me. Through talking to her I gained a better understanding of how my stomach worked and the problems digesting food started to make sense to me. She recommended changes to my diet, a course of food supplements, and after taking the advice, I felt better almost immediately. After several sessions, through Sophie’s help, I discovered that I had an intolerance to wheat and gluten, and together with my own research into food combining, I can now eat the food that I want; even things like chilli, onions and garlic which I thought were a problem. I would wholeheartedly recommend Sophie to anyone who has a problem such as mine. She is always professional, and is sympathetic, knowledgeable, and positive. 'When my daughter, aged 6, started showing signs of Tourette’s Syndrome we were heartbroken. To see your child suffering yet to be told by the doctors there is nothing you can do is a terrible thing to bear. By going to see Sophie on the recommendation of a friend, I felt realistic, but hopeful once again. The nutritional advice and supplements we were given to support her general health and well-being have, I believe, helped to dramatically reduce my daughter’s symptoms. The tics have not vanished; they are still there, but they are less frequent and are exhibited in a less obvious way. One of the most noticeable ways in which we have seen improvement is in my daughter’s mood and overall well-being. By making simple diet changes we have been able to control what I first believed to be associated tempers and rages, now they are virtually nonexistent. In addition she now goes to sleep better and stays asleep longer. It is so reassuring to know that at this very difficult time we are ensuring that my daughter’s mind and body receives all the nutritional help it possibly can. Sophie has been a great help and support in answering all my questions and helping me wade through the amount of research I have come across in trying to find a suitable treatment for this under researched condition'. 'I really didn’t expect such results and was unaware that my diet was making me feel so ill.
'Sophie's advice was incredibly helpful - I have never looked or felt better. The changes she suggested made a huge difference and I am a thousand times better than before. I can't recommend her highly enough'. 'Sophie’s advice was instrumental in helping me lose a considerable amount of weight. Having lost the pounds the trick was then to maintain it. Recommendations offered by Sophie have proved crucial in keeping the weight off but have at the same time ensured that my diet is healthy and nutritious.